Make Our Lovely Casa Your Home by the Sea. 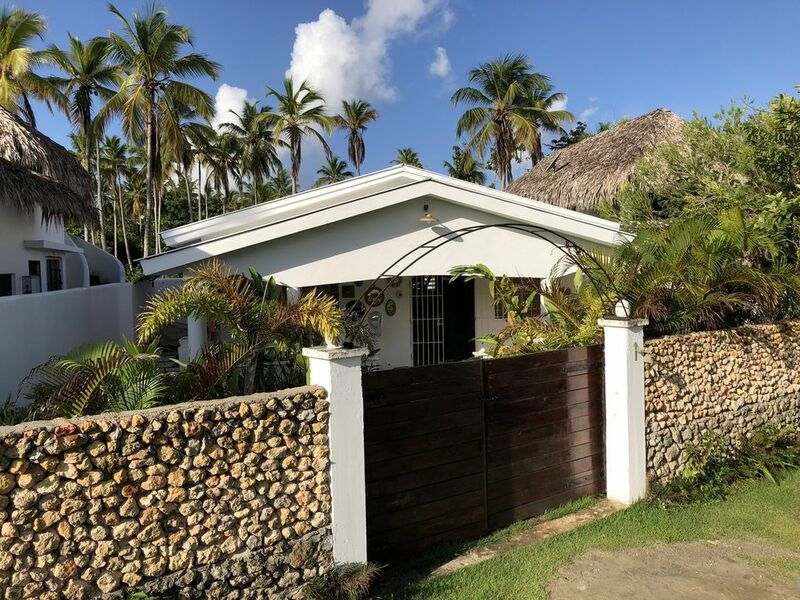 CASA CARIBE BLANCO – at Villa la Caleta, Las Galeras, Dominican Republic - is a two bedroom, one bath, whole house that comfortably sleeps four in a quiet location by the sea. (ocean-view, beach less than 2-minute walk) Well away from the hustle and bustle of the all-inclusive scene, this is an off-the-beaten path vacation spot where memories are made. English, Spanish, and French Spoken. Las Galeras is a small fishing village surrounded by cerulean waters on the North East Coast on the Samana Peninsula in the Dominican Republic that is literally at the end of the road – far from the big resort towns, and right where you belong. Enjoy a memorable Caribbean getaway here at CASA CARIBE BLANCO - the perfect remedy for those not interested in spending their vacations in a corporate all-inclusive scene. Our home is a place where you can be as active as you want to be, lay out at the beach, explore the tropical jungles, go boating, hiking, horseback riding, swim, kayak, SCUBA dive or snorkeling, you name it. The Las Galeras is truly a one-of-a-kind tropical wonderland of world-class beaches and lush jungles, where friendly locals and an eclectic international ex-pat community are all ready to welcome you to a comfortably safe outpost that has yet to be "discovered" by the masses. During the months of January, February, March, and sometimes into the beginning of April, the seas off of Las Galeras are home to migrating Humpback Whales that come to breed, and give birth. Book early and be here to experience these gentle giants at play in their natural waters. Group and private excursions are available and may be booked through your on-site manager. Life in Las Galeras revolves around the sea. Viewed from your private terrace, the ocean is a less than two-minute stroll from CASA CARIBE BLANCO. There you will find a natural cove with coral outcroppings, tidal pools and a beautiful, clean sandy beach lined by coconut palms. We are located nearby all the area’s marquee beach destinations; Playita, Playa Madama, Playa Fronton, and Playa Rincon - voted by travelers from around the world as one of the top 3 most beautiful beaches on earth. The local beaches can be reached on-foot, via motoconcho (motorcycle taxi), regular taxi, by boat, or on horseback. Scooter and ATV rentals are available in town as well. We have a comprehensive "what to-do while in Las Galeras" list that will be delivered upon your reservation. CASA CARIBE BLANCO is a thoughtfully designed, quaint tropical seaside villa with very high ceilings and ceiling fans that keep things fresh during even warmest of days. Our home comfortably sleeps four with two spacious bedrooms - each with a queen-sized bed. We have one bathroom with a hot water shower and well stocked with linens. Our home has a fully equipped kitchen, a cozy living room area and a dining area that seats six. Enjoy our spacious terrace with comfortable seating as well as outdoor dining area - and access to our private garden. An outdoor shower is there to wash away the sand between your toes after a lovely day at the beach. Washing machine is available for guest use. Children and Pets are warmly welcomed to our family friendly villa by the sea. Please inform us when you make your reservation so we may be prepared for your little ones. Manager lives nearby and can arrange a multitude of services or reservations prior to your arrival. Whether you would like a massage on your terrace or a scuba excursion - just let him know what you need – then kick back, relax, and enjoy all Las Galeras has to offer. If you need other services, such as daily housekeeping, cook, etc., all can be scheduled for a fee and arranged through the manager. CASA CARIBE BLANCO is “miles away from ordinary” and 2.5 kilometers from the Las Galeras crossroads one and a half of those km’s are down a bumpy country dirt lane. Remember, the best adventures start at the end of the paved road…! Here in Las Galeras, there is less infrastructure so it's a lot more untouched, you're going to have a lot less tourists and a lot more privacy. There are a number of transport options available should you decide not to rent a car. To get around quickly, the easiest and least expensive way is by Motoconcho, which is a motorbike taxi. Figure 100 RDP from town to CASA CARIBE BLANCO as well as 100 RDP from our home to Playita Beach. To travel to Samana or Las Terrenas, you can travel by local bus, "Gua Gua" (small pickup truck or van taxi) or by regular taxi, which are all available in town at the beach end of the main road. We will provide contact info for trusted transport providers on completion of reservation. Please be aware that Las Galeras is a small village with only a few small markets that are not as well stocked as your supermarkets at home. There are staples available, of course, and plenty of delicious fresh fruit and seafood, a lovely French bakery has fresh begets and croissants daily. We suggest making a stop off in Samana to get supplies and any specialty items you may require. You can also easily make a half-day trip into Samana town for groceries or a day-trip to Las Terrenas for super market and shopping visit. This is the place you've been looking for if your idea of Paradise is somewhere miles away from the resorts and all-inclusives that are all around the Caribbean. We're not talking about camping - but a place where you can be as "away from it all" as you care to be. Please make our home – your home and come to beautiful Las Galeras to truly get away from it all – Dominican Style…! The beach in 3-minutes across a palm glade. You can see the sea from our terrace. Beautiful surroundings, quite, friendly people, close to the beach, all in all wonderful! We stayed for a month, January 19 to February 16. The house is clean and well equipped with everything that we needed, even a BBQ (charcoal). We each had a bike to get back and forth to town which is about 2 kilometres. The people in town are friendly and they help you get what you want. Fiona and Bill gives you a very helpful list of where to go and what to do. This was very helpful in every way. We eat most of the time in our paradise home but did go out a few times, not too far from the house. A car is not necessary, as we stayed close to our beaches which were perfect for us. We visited other beaches for a change but found our beaches we enough for us. We swam in the morning, ate lunch, rested and then went swimming again. A perfect vacation. Internet is stop and go but we are not here to work or chat. Games are included in the house and a few books. Being your own entertainment for the evening. We would recommend this place very strongly to anyone. Fast alles war perfekt: Die geschmackvolle Einrichtung mit hübschen Dekorations-Details (kleine Skulpturen, Kerzen, Bilder, Kissen, Decken etc. ), bequeme Betten, gut eingerichtete Küche mit allem, was man braucht.Viele Lampen an den richtigen Stellen. Wir waren in einer Zeit dort, in der es sehr heiß mit hoher Luftfeuchtigkeit war (Oktober). Im Wohnraum und in den beiden Schlafzimmern gibt es große Deckenventilatoren, nur nicht im Bad und in der Küche (dort war es am heißesten). Leider waren die Glasfenster durch Holzlamellen ersetzt worden, die sich nicht öffnen ließen, so dass es immer ziemlich dunkel im Haus war und man auch abends, wenn es etwas kühler wurde, keinen Durchzug machen konnte. Das war schade aber auch die einzigen Nachteile. Wir haben uns sehr wohl gefühlt! Als wir angefangen haben, unseren Urlaub in der Dominikanischen Republik zu planen, war uns schnell klar, dass wir weit weg von den massentouristischen Orten wohnen möchten. So fiel unsere Wahl auf das Haus von Fiona und Bill in Las Galeras. Bevor wir das Haus buchten, stellten wir Fiona ganz viele Fragen, die sie ganz schnell beantwortete. Und schon am Anfang hatten wir das Gefühl, sehr gut betreut und aufgehoben zu sein. Fiona half uns nicht nur den Transfer vom Flughafen zu organisieren; sie kümmerte sich auch darum, dass uns die Autokindersitze (was für die Dominikansiche Republik nicht selbstverständlich ist) zur Verfügung gestellt wurden. Außerdem schickte uns Fiona eine Broschüre über den Aufenthalt in Las Galeras, die sehr hilfreich war. Als wir gelandet sind, nahm Bil sofort Kontakt zu uns auf, um sicher zu sein, dass es uns gut geht und dass wir den Manager, der uns abholt, problemlos finden. Das Haus ist sehr liebevoll mit nützlichen Sachen und vielen kleinen schönen Details ausgestatten. Ich freute mich über gute Pfannen, einen Joghurtmaker, viele andere Küchengeräte und die deutschen Bücher. Die Kinder waren von den Tischspielen, vom schönen Garten und vom Wasserschlauch in der Außendusche begeistert. Mein Mann war glücklich, auf dem Regal eine Tauchmaske samt Schnorchel gefunden zu haben. Wir hatten kein Auto. Das war aber kein Problem, obwohl das Haus ein paar Kilometer vom Zentrum Las Galeras enfernt ist. Zweimal die Woche kommt ein Track mit frischem Obst und Gemüse (unglaublich lecker!) vorbei. Fisch und andere Meeresprodukte konnte man jeden Tag bei den vorbeikommenden Fischern kaufen. Jederzeit konnte man sich ein Motoconcho bestellen um ins Zentrum zu fahren und alles notwendige zu besorgen. Im Nachbarhaus wohnen die beiden Manager: Dario und Sabrina. Wir konnten uns jederzeit an die beiden mit den Fragen und Bitten wenden. Sie halfen uns das Moto-Taxi zu bestellen, gaben Auskunft über die lokalen Preise und kochten für uns leckere Mahlzeiten. Wir fühlten uns in diesem Haus und an diesem Ort immer sicher. Einmal konnten wir den Hausschlüssel nicht finden und gingen dann zum Strand ohne das Haus einzusperren. Es ist nichts passiert! Liebe Fiona und Bill, liebe Sabrina und Dario, vielen herzlichen Dank für die glückliche Woche in Las Galeras von unserer ganzen Familie! Las Galeras is a small fishing village surrounded by cerulean waters on the North East Coast on the Samana Peninsula in the Dominican Republic that is literally at the end of the road – far from the big resort towns, and right where you belong. Enjoy a memorable Caribbean getaway here at CASA CARIBE BLANCO - the perfect remedy for those not interested in spending their vacations in a corporate all-inclusive scene. Our home is a place where you can be as active as you want to be, lay out at the beach, explore the tropical forests, go boating, hiking, horseback riding, swim, kayak, SCUBA dive or snorkeling, you name it. We do offer WiFi - but please remember - we are far from the everyday and out at the "end of the road"... so you can expect connectivity and have access to email and social media, etc. streaming movies and such - not so much. Casa Caribe Blanco is a great place to Digital Detox...Enjoy...!! !